Clarion County Trails Association – Biking, Hiking, Canoeing, Kayaking, Horseback Riding, Snow Shoeing, Geocaching and more! Biking, Hiking, Canoeing, Kayaking, Horseback Riding, Snow Shoeing, Geocaching and more! Please check out the Keystone Fund – More info to come. Also visit the South Mountain Partnership – More info to come. Check out the New Trail Map! Visit the Trail Links section to view Websites of each Trail. The newest addition to the NCT of Clarion County Clarion County Chapter has been busy developing a spur to the North Country Trail. 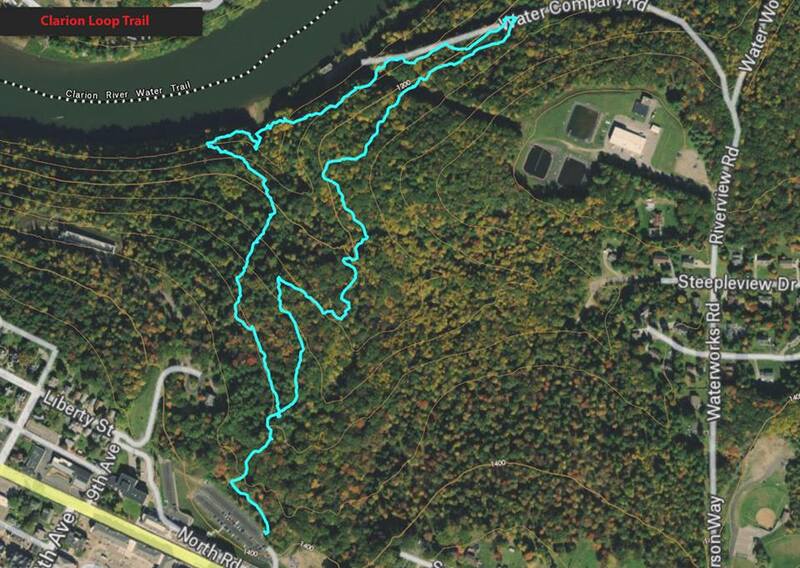 Over the past four years Clarion County Chapter has been working to gain accesses, get permits, build the trail and sign the spur which is a three mile loop connecting the town of Clarion to the nearby Clarion River. The trail begins at the corner of the college parking lot and winds downward through a variety of hemlock and hardwood trees. You will pass over creeks, around large moss covered rocks, until you view the river below. The trail then goes to the river where you can sit and enjoy our one of a kind river. Because this section of the river is actually part of a reservoir the tree branches rest on the water and when the light is right it creates spactacular mirror images. On the return uphill, switchbacks have been added to make for more great viewing as you assend back to the parking lot and your car. Informational signs have been placed along the trail. These along with directional signs were made possible with a grant through Clarion University. We now have designated trail parking signs, directional signs and along the trail three informational signs. To involve more of the locals of Clarion County the Clarion County Career Center’s welding shop was contacted and agreed to construct steel frames for the signs. The information to be put on the signs was written by university students. A grand opening for the trail is scheduled for April 14, 2018 where the university and the community will be invited to explore and enjoy the new trail. You can also email info@VisitPaGo.com or call 814-849-5197 with your address and have a map sent to you. Parker to Bear Creek and back. Check out the Clarion University Loop Trail! It’s about 3 miles long.